Fantastic water pressure in the shower...awesome! Clean and quiet! Close to many dining options. I would stay there again. Friendly staff, good breakfast, clean room. We used the swimming pool. It was a very nice stay. Unfortunately, the trucks passing are very noisy, we had to sleep with earplugs. But we can recommend this hotel. Good price for the offered comfort. Good starting point for excursions. Where to find Moab hotels near an airport? How can I find hotels in different Moab neighborhoods? 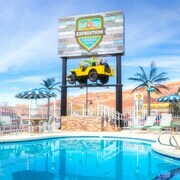 Where can I find hotels in Moab that are near tourist attractions? If you are searching for upscale or affordable accommodation options in or near Moab, Expedia provides many suitable options. Spend some time checking out Expedia's 43 accommodation listings, which are all within a 0.1-kilometre (0.06-mile) radius of central Moab. Travelers looking for Expedia-listed hotels and accommodations close to the heart of Moab, should browse the latest offers at the 57 Robber's Roost and Best Western Plus Canyonlands Inn. Accommodation in Monticello which is approximately 80 kilometres (50 miles) away include Rodeway Inn & Suites and Inn at the Canyons. 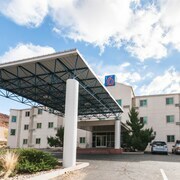 Hotels in Green River include Holiday Inn Express Green River and Comfort Inn Green River. Green River is 70 kilometres (43 miles) away. If you are a budget traveler and are looking for mid-range or low-budget Moab places to stay, you'll find that there are enough economy places to consider in the area. The Moab Lodging Vacation Rentals is 1 kilometre (1 mile) from the heart of Moab, while the Best Western Plus Greenwell Inn is 0.2 kilometres (0.1 miles) away. 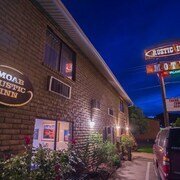 Other Moab hotels in the cheaper range include the Aarchway Inn and the Rodeway Inn & Suites Landmark Inn. The Sorrel River Ranch Resort is positioned 19 kilometres (12 miles) from downtown Moab. Another hotel is the Moab Under Canvas, which can be found 17 kilometres (10 miles) away. 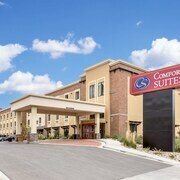 Alternatively, check out the rates and amenities at the Hampton Inn Moab or the Accommodations Unlimited of Moab. The nearest places to spend the night in Southeastern Utah - Glen Canyon National Recreation Area are Arches National Park and Green River. Arches National Park is 8 kilometres (5 miles) to the northwest of Moab, while Green River is 70 kilometres (43 miles) to the northwest. 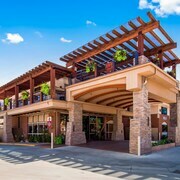 Hotels in Arches National Park are the Moab Valley RV Resort & Campground and Fairfield Inn & Suites by Marriott Moab. While apartments and hotels include the Super 8 Green River and Knights Inn Green River/West Winds. If you are into sports and really like games you might like to head to Old Spanish Trail Arena, which is 8 kilometres (5 miles) to the southeast of Moab. For travelers who are keen on booking a room close by, make a reservation in the Moab Beds and Bagels or Moab Condos 4 Rent. Why not visit Expedia's up-to-date Moab travel listings and explore the many things that this part of the world offers visitors. What are the most popular Moab hotels? Are there hotels in other cities near Moab? What other types of accommodations are available in Moab? Explore Moab with Expedia.ca’s Travel Guides to find the best flights, cars, holiday packages and more!